Prince Harry was spotted at the Invictus Games in Toronto on Wednesday night, munching on popcorn and enjoying the sitting volleyball event, when a toddler reached over and took some of his popcorn. The adorable moment was caught on video. 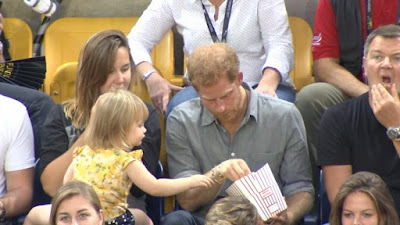 In it, two-year-old Emily Henson, who is the daughter of a British Army veteran who lost both his legs in Afghanistan, was sitting on her mother's lap beside Prince Harry when she decided to help herself to some of his popcorn. At first, the Royal teased her by pulling the popcorn away from her but he later offered her some. He was later seen chatting with the toddler's mother and entertaining Emily. Prince Harry appeared to be very relaxed as he entertained the child. Emily's father is Dave Henson, a former Royal Engineer who captained the UK team at the first Invictus Games in 2014. Meanwhile, royal watchers in the arena are saying the warm way Harry treated Emily is evidence that he wants to be a father.